As you all may have seen through our blog or Facebook, October is Pregnancy and Infant Loss Awareness Month and we wanted to do something special to commemorate it. It was back in 1988 that President Ronald Reagan proclaimed October as such. 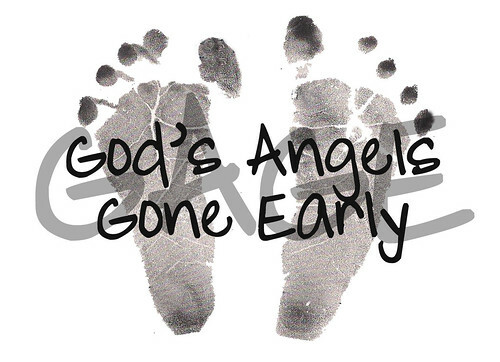 We want to recognize the loss parents experience and also remember all of our Angels that are taken too early. Throughout the month of October we will have the opportunity to hear from some amazing guest bloggers as they tell us their stories. Although this month may be more so targeted at the loss of infants, we want to remember all of the Angels gone too early, regardless of their age. We will hear a couple stories of the loss of older children - no matter what the age of a child when they pass... It is always too soon. The pain is no less or different. We want to remember all of these angels and provide a place where families can come to find comfort and others who have experienced loss as they have. We hope that you all will come and read these guest posts throughout the month and support these amazing people who are being so kind to share their stories with us. We are very grateful for this opportunity and to those guest bloggers who we have had the opportunity to work with. We also wanted to let you all know that even though October as a whole has been proclaimed Pregnancy and Infant Loss Awareness Month - October 15th has been chosen as Pregnancy and Infant Loss Remembrance Day. It is on this day, in all time zones around the world, that we are asked to light a candle at 7 PM in remembrance. You can read more about this day at October15th.com.